Description	 MS in Syriac on vellum, Syria(? ), late 5th c., 5 1/2 ff., 29x21 cm, 2 columns, (22x17 cm), 24 lines in a clear early Syriac estrangela book script, titles in red, later liturgical instructions in red. Binding	 Boston, Mass.(? ), 1920-1960, grey shirting folding case. Context	 Part of Mt. Sinai: St. Catherine's monastery, Sin. Syr. 3 with Romans 11:6 - Hebrews. 1 f. (Romans 10:8 - 11:6) in Milano: Bibliotheca Ambrosiana. There are 20 MSS from Mt. Sinai in The Schøyen Collection. Besides the monastery's own famous library (4300 MSS), only British Library (8 MSS) and The National Library of Russia, St. Petersburg (60 MSS, mostly fragments), have comparable holdings. 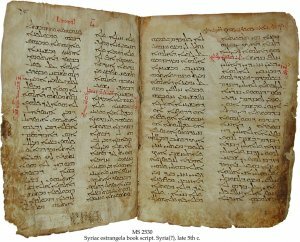 The Old Syriac text from 3rd-4th c. is only preserved in 2 MSS of the Gospels, the famous Sinaitic and Curetonian Gospels, both ca. 500. 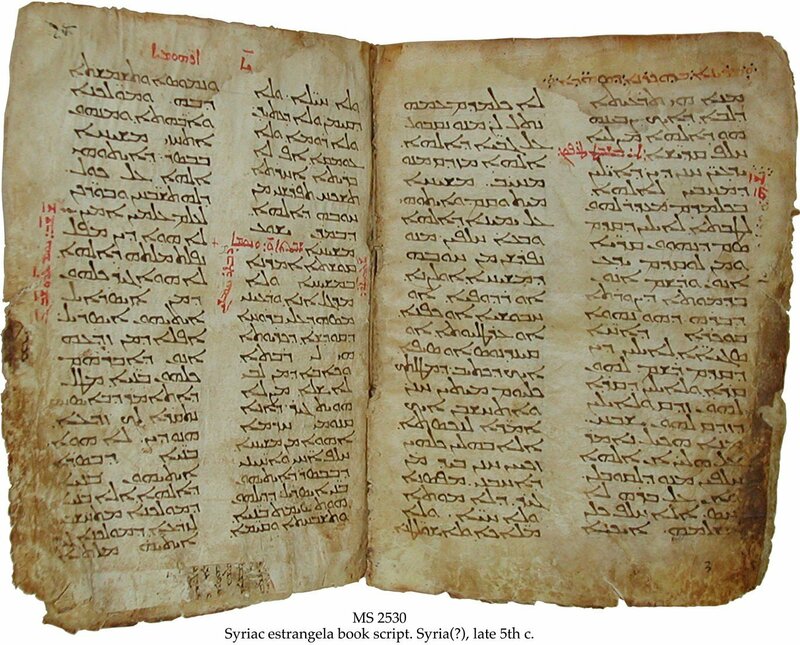 For the epistles there are no MSS with the Old Syriac text known, only the standardized Peshitta text. The 6 earliest MSS, all ca. 500, have nevertheless some Old Syriac readings. MS 2530/Sin. Syr. 3 is the one with the highest number of Old Syriac readings; thus being the most important of these earliest MSS. Dr. Andreas Juckel made the attribution to Sin. Syr. 3, and kindly supplied the above information. Published	 Description in Judith Oliver: Sacred and Secular, from the collections of the Endowment for Biblical Research and Boston University. Boston 1985, p. 8. Dr. Andreas Juckel: Ms Schøyen/Sinai syr. 3 and the New Testament Peshitta. In Journal of Syriac Studies, vol. 6,2. July 2003. Exhibited	 NorFa - Nordic network in Qumran studies. Symposium in Oslo 3-5. June 2004.